This year, we thought we’d do something different in August... 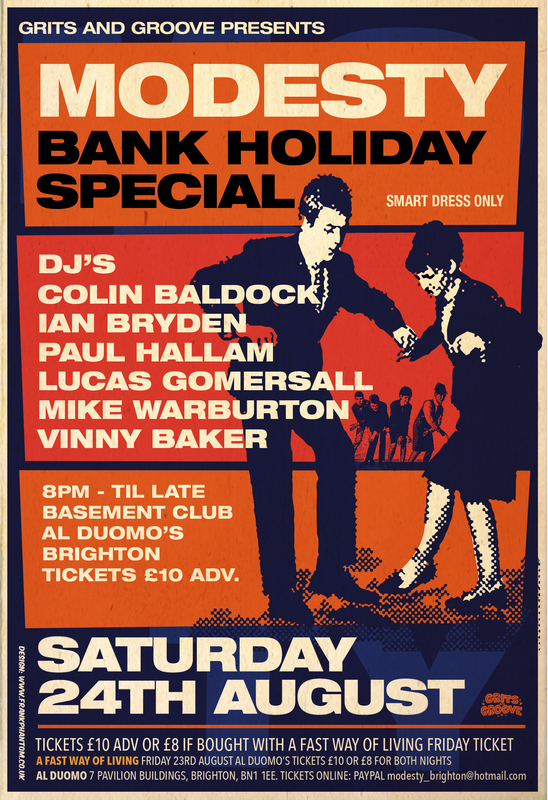 In conjunction with our friends at Modesty, we have decided to bring you a new event for the Friday night of the bank holiday weekender in Brighton, to provide the authentic mod event for the Friday night we think you’ll want! We have booked you some mighty fine DJ’s to suit and the event will run in collaboration with modesty. We will offer a discounted ticket for those who purchase both Friday and Saturday night tickets from us. I am proud to introduce to you Nicholas Louchart all the way from France... Callum Sammon and Jodie Richardson the power couple from Leeds and Norfolk respectively... Jim Watson of Soul on the Square who you all should know and Mr Bryden will be joining me to tie everything together. Modesty's August Bank Holiday Special will also be returning to the Downstairs Club at Al Duomo's, Brighton on Saturday 24th August to play the hippest sounds to the best dressed crowd a of the weekend This year's event will see Ian Bryden hosting once again, the wonderful Mike Warburton (MG Blues), and brilliant young gun Vinny Baker join residents Colin Baldock and myself.... AND we are very happy to announce that Sneakers legend and all round top fella Paul Hallam has agreed to spin some tunes for y'all ! Fast Way of Living at the Al Duomo. Don’t miss your twist or be late to do the shake! Modesty's August Bank Holiday Special will be returning to the Downstairs Club at Al Duomo's, Brighton on Saturday 24th August to play the hippest sounds to the best dressed crowd a of the weekend This year's event will see the return of our great friend Lucas Gomersall (Fast Way of Living), the wonderful Mike Warburton (MG Blues), and brilliant young gun Vinny Baker join residents Colin Baldock and Ian Bryden.... AND we are very happy to announce that Sneakers legend and all round top fella Paul Hallam has agreed to spin some tunes for y'all ! This topic has been moved to MUSIC. This New Years' Eve, join us for the most authentic Mod Club Night in the UK. James Brown - Mashed Potatoes U.S.A.
One month to go until the long awaited return of Hip City!!!! Looking forward to seeing old faces and new, dancing the night away to our stellar lineup of special guest DJs Danny Watkins, Dave Edwards, Ian Bryden, Mike Warburton and Vinny Baker! Upcoming mod events / MODesty August Bank Holiday Special .... SOLD OUT!!! 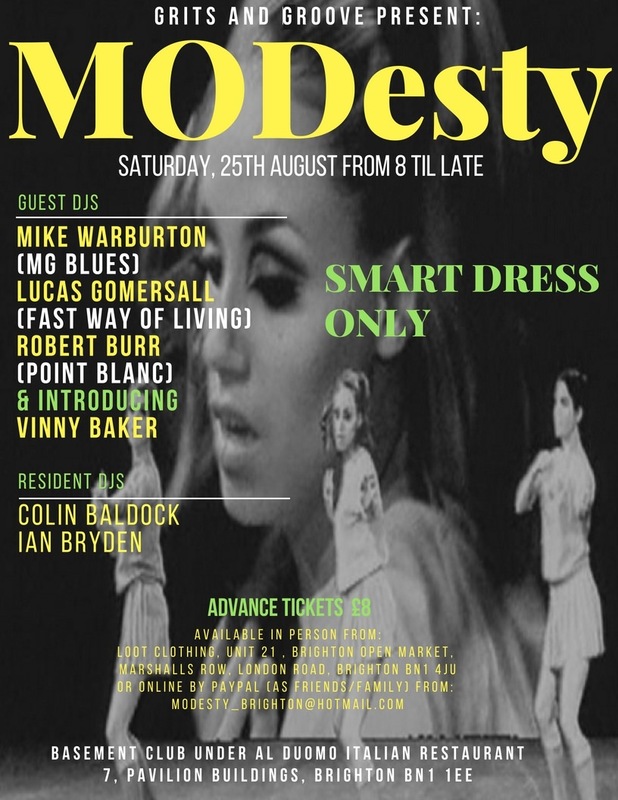 Following the success of last year's August Bank Holiday Modesty night, why not join us at Al Duomo, 7 Pavilion Buildings, Brighton on August 25th for the only "Smart Dress Only" event of the weekend? Nearly half of the 200 tickets already sold!!! Recently received the two latest offerings from Jason Brummell's Suave Collective Publishing .... quite enjoyed jason Disley's Mod Noir effort "7 Day Fool" and currently thoroughly enjoying my friend Dave Dry's wittily written recollections of modding about in West London in the 60s ... "My Generation"
With the August Bank Holiday NUTS do at the Komedia being sold out already, why not treat yourself to tickets for the The Modesty Anniversary Party & join us at Al Duomo, 7 Pavilion Buildings, Brighton on August 26th to celebrate 10 years of Modesty nights at the Brighton Weekender at the only "Smart Dress Only" event of the weekend?